[Winter is finally drawing to a close and I’ve got a rare day with nothing much to do, so I thought I’d write up a post. I’m going to post it here in the bird forum because where I live winters are cold and we don’t see many herps! 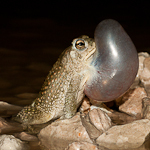 I posted the first ¾ of 2016 in the herp forum last September. You can view those post here- http://www.fieldherpforum.com/forum/vie ... =2&t=23762, http://www.fieldherpforum.com/forum/vie ... =2&t=23763, and http://www.fieldherpforum.com/forum/vie ... =2&t=23764. This post starts in mid September when I attended a fund raising event for Wildlife Rescue Inc. New Mexico called “Breakfast with the Birds”. Basically for a $50 donation they treat you to an outdoor breakfast and then bring out some of their rescue birds for photographing. I tried to include some of the injuries the birds had sustained in some of the pictures in addition to trying to get more natural looking pictures. This Long-eared Owl has a bad eye. Apparently this is a pretty common injury in owls that results from hitting moving vehicles. It was well worth the $50 and the money went to a good cause. To add icing to the cake this Great Horned Owl picture sold just over a month later, more than paying for the donation! This Screech Owl has a bad right eye, also from a vehicle collision. I shot some pictures that showed the bad eye, some that completely excluded it, but my favorite is this one where the good left eye dominates, but you can just barely tell there is something off with the right eye. On October 1st I paid a visit to a den in the Magdalena Mountains. It seemed a little early yet for the snakes to have arrived, but I did see a nice Crevice Spiny Lizard. As I was leaving I got buzzed low on the slope below the den. The buzz was coming from beneath a rock sitting on top of a large bolder at the bottom of a talus. When I lifted the rock this little lepidus made a dash for cover, but ended up “stuck” in the crook where two boulders butted up against one another. It was about a ½ meter drop to the talus below and the snake was absolutely reticent to make that drop. It just stayed there, wedged in between the boulders, while I shot away. Not the usual outcome when trying to photograph lepidus on talus! Late season Massasauga on October 9th. October always brings out hordes on male Tarantulas looking for females. I keep telling myself I need to try following a male until it encounters a female’s burrow and then try to photograph the mating attempt, but for whatever reason I just haven’t yet. Its on my agenda for next fall. On October 15th My friend John and I were in the San Mateo Mountains and I was surprised when we found a stock pond full of Spea tadpoles. The monsoons where late this year, but I would have expected these to have metamorphosed long ago. Diamond-back laying out at a den on October 22nd. This picture is disappointing in that I never got what I had envisioned, but there is a funny story that goes along with it. I saw this turtle crossing a levee road at Bosque del Apache and I watched her for a while expecting her to slide into the canal she was heading for. Instead, to my surprise, she began crossing the canal via a foot-bridge. I worked my way around in front of her and lay on the ground with most of my body hidden from view behind the railing on the opposite end of the bridge. My plan was to photograph her walking towards me, but before she got close enough for a frame filling shot a young couple parked and came over to cross the bridge. The young man said, “Oh look, a turtle”, and reached down to pick her up. Just about that time I said something to the effect of, “You know you’re not supposed to pick the animals up on a National Wildlife Refuge”. They had no clue I was there and I think I gave them a pretty good start! Diamond-back laying out on November 8th. I love the crypsis these big snakes can display. I nearly walked over this snake before seeing it! One of the really cool things about living in Albuquerque is the access we have to various different natural or semi-natural areas. The city was visionary in buying and setting aside open space. One of my favorite open space areas is Los Poblanos Fields, which was purchased to preserve some of the last remaining farm land in Albuquerque’s north valley. That’s were this Phoebe was photographed. I don’t see Bushtits very often, but they are a blast to try to photograph. They seem to never sit still! There’s a family of Coyotes that call Los Poblanos Fields home. One evening right about sunset I heard them calling as they roused for the evening. I followed along as they moved through some fields and when they came to these large hay stacks, first the two juveniles, and them mom jumped up on top as if to pose for a family portrait! Evening settling in over Los Poblanos Fields. The go-to place for Sandhill Cranes this year has been the Bernardo Waterfowl Area, about 50 miles south of Albuquerque. Bosque del Apache has seen fewer and fewer Cranes over the last couple years, while Bernardo has hosted more and more. It used to be that only a few locals knew about Bernardo, but the words out now, and while I used to feel like I had the whole place to myself when I visited, that’s not the case anymore! You can often get pictures of Cranes flying with the Manzano Mountains as a background at Bernardo, but otherwise I think Bosque del Apache still trumps Bernardo for scenery. In late November I think every Pintail in the country was at Bosque del Apache. While Bernardo may have larger numbers of Cranes, Bosque del Apache still offers some situations that Bernardo doesn’t. One of those is the ability to photograph the Cranes at their roosting ponds as they arrive in the evening. They always seem to be thirsty after a day of eating dry corn in the fields. 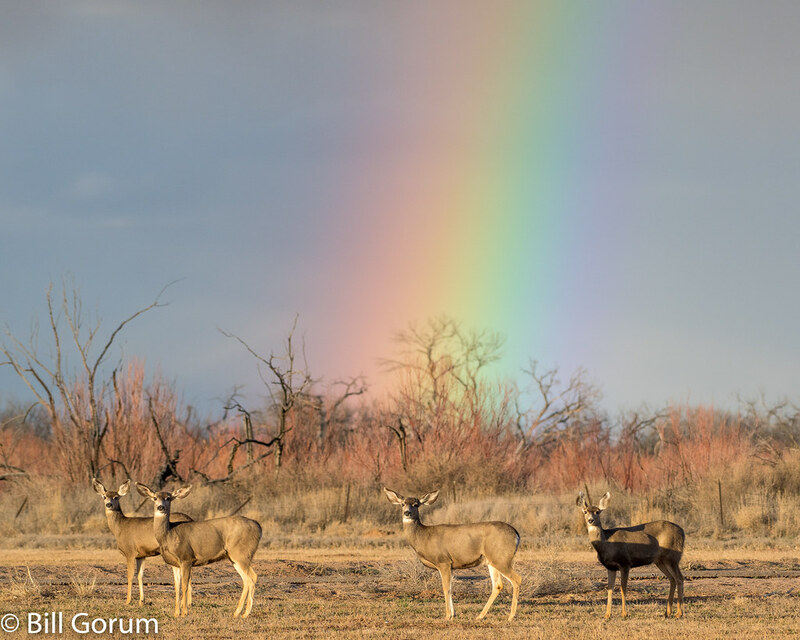 Bosque del Apache also can’t be beat on the sheer variety of animals and situations available to photograph. Los Poblanos Fields can be a pretty decent place to photograph Cranes at time too. Just playing around with slow shutter speeds and panning after sunset at Poblanos Fields. Roadrunner basking on a cold, but sunny, afternoon. 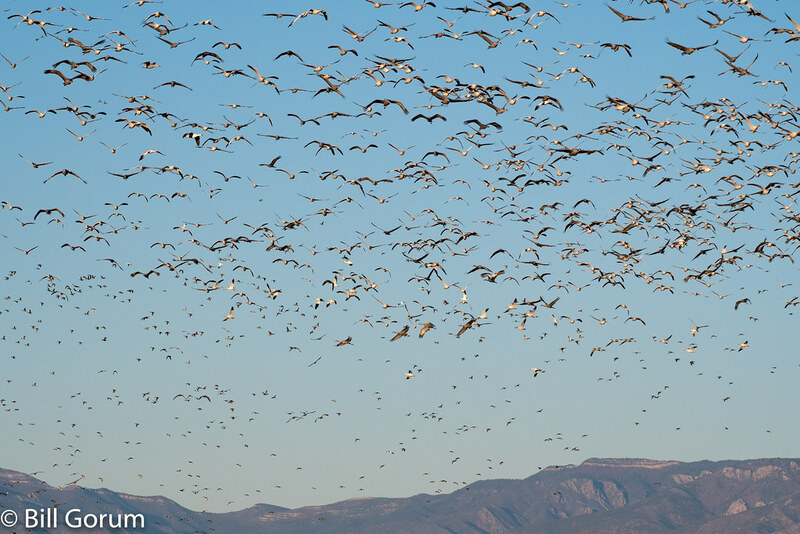 One of the things Bosque del Apache is famous for are the morning “blast-offs” of Snow Geese. They are awesome to witness, but surprisingly difficult to photograph in a way that conveys the power of the experience. I’ve had an idea for a photograph of the blast-off that involves lots of geese, early morning mist, and the rising sun. I woke at 4 a.m. one day of almost every weekend to head down and try to take that picture. In early December the geese would always take off too early, well before the sun was ready to peak over the horizon! After the Geese blast off I would head over to the Crane ponds. (Cranes like to sleep in a little later than Geese do)! Usually the Cranes start leaving just about the time the sun is coming up. The best mornings to photograph them are ones with some wind. You can always tell when a group of Cranes is getting ready to take off because they will lean into the wind. Then, because of their mass, they have to get a running start to get airborne. On calm days they just sort of lift straight out of the water and its not nearly as much fun to photograph. A tender moment among Ravens. One evening at Los Poblanos Fields I found these Sandhill Cranes eating grass seeds. It was interesting to see such large birds going after such small food items. The seeds must be pretty nutritious or delicious because I saw more than a few squabbles break out over particularly full looking seed heads. On my very first visit to Poblanos Fields a birder told me about a nest box that had a resident Screech-owl. I kept checking, and finally one evening in mid December I caught the Owl home. Now I’ve just got to keep trying for a picture with its eyes open! Sometimes photographing wildlife involves anticipating what they are going to do. One morning at Bosque del Apache I saw two Javelina running through an alfalfa field. I was pretty sure I knew where they would exit the field so I got there ahead of them and crouched down and waited. Sure enough they came out exactly where I thought they would. I only got pictures of one though, because the first one came out a lot closer to me than I had anticipated. The only shots I got of it were close-ups of its front leg and snout! This is the second one, which passed a little farther away from me. I think the beauty of Ravens is underappreciated. Immature and adult Snow Goose. In general Bernardo is not a great Snow Goose location. However, one evening in late December they had just knocked down some corn right next to the tour loop. I parked my car and sat at the edge of the road, next to the still standing corn at the edge of what they had knocked down. In a fairly short time I had a huge flock of light geese literally feeding at my feet. This is the only really accessible roosting pond at Bernardo and the Cranes always seem to be really far away here, unlike at Bosque del Apache where they can sometimes be really close at the roosting ponds. The female Coyote from Los Poblanos. I love her reddish coat and two differently colored eyes! One of her pups. 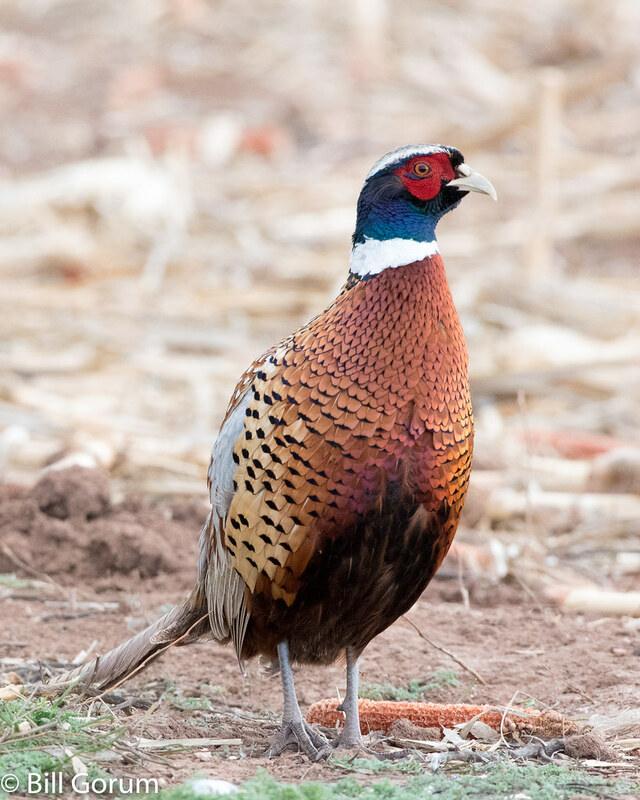 This guy/girl and I surprised one another this particular evening when it unexpectedly came up out of a dry irrigation ditch right next to where I had sat down to wait for it. I knew it was somewhere in the vicinity, but didn’t realize just how close it was. I had been told by a local resident that the other pup had been attacked by a dog and looked like it would probably die. I saw that pup with its mother shortly after my conversation with the resident and it did indeed look pretty bad. I was happy to see the pup a couple weeks later, still looking pretty scraggly, but apparently feeling well enough to play with mom! The little ones are so cute! The big ones are kinda cute too! Different subspecies of Sandhill Crane. The taller one in the back is a Greater Sandhill Crane, the two squabbling in the front are either Canadian or Lesser Sandhills. I don’t know how to tell the two smaller subspecies apart. One of the behaviors I became interested in photographing this winter was the scuffles that take place between Sandhill Cranes. This is a behavior I see far more often at Bernardo than at Bosque del Apache. My guess is that it’s because the Cranes are so much more crowded at Bernardo. The birds will start out by calling and posturing and if one doesn’t back down then a fight erupts. Both Cranes jump into the air and attempt to scratch and or bite one another. This is how the Cranes take off from the roosting ponds in the morning when there is no wind. There’s a part of me that wants to clone out one Crane from this photo, (groups always seem to work best when you have odd numbers), but the purist in me won’t let me do it. There’s at least one immature male in there as well! (Just for the record, I think the out of focus telephone pole in the background really does lean, though my horizon might be off just a bit as well). This is an example of why I say that even though Bernardo may now be the go-to place for Sandhill Cranes it can’t compete with Bosque del Apache as a scenic setting to photograph birds. It’s often really difficult to take shots that don’t include various man-made objects in the background at Bernardo. Ever had one of those days when you should have just stayed in bed? January 16th was one of those days for me. It had rained all night before and so I wanted to get up early and head to Bosque del Apache in hopes of getting mist. On the way down there was mist throughout the valley. I was psyched! As I drove onto the tour loop however, I was stopped by a refuge employee who informed me that, due to muddy road conditions, the refuge was closed! So I headed out to the Crane ponds, which are located right beside NM 1, which is paved. There were some Geese roosting there and they would take off in small groups straight towards me. No more mist, but I still liked the way they were flying and shot lots of pictures. I left and headed up to Bernardo, which it turns out, was also closed. So then I headed west towards the Sierra Ladrones to shoot some landscapes and that’s when I discovered that my camera was set to -2 stops exposure compensation and I had just underexposed every shot I took of the Snow Geese at Bosque del Apache! This is a bonehead mistake that I make more often than I’d like to admit. Nikon, if you’re listening, please give me the ability to set my camera so that it cancels any exposure compensation or bracketing whenever I turn it off! One of the Crane ponds just off of NM 1 at Bosque del Apache. Just a few years ago this would have been starting to fill up with Sandhill Cranes at this time of day. 1 ½ of the three elements I wanted for a blast-off picture. I got the rising sun- that’s one, but no mist and not as many geese as I wanted, (I’ll give the number of geese a ½). This was my last blast-off picture of the season. This was at the end of January and by February the geese are beginning to head back north and the numbers are a lot smaller. This female Pyrrhuloxia has been hanging around the bird feeders at Bosque del Apache this winter. I keep hoping a male will join her, but so far I haven’t seen one. 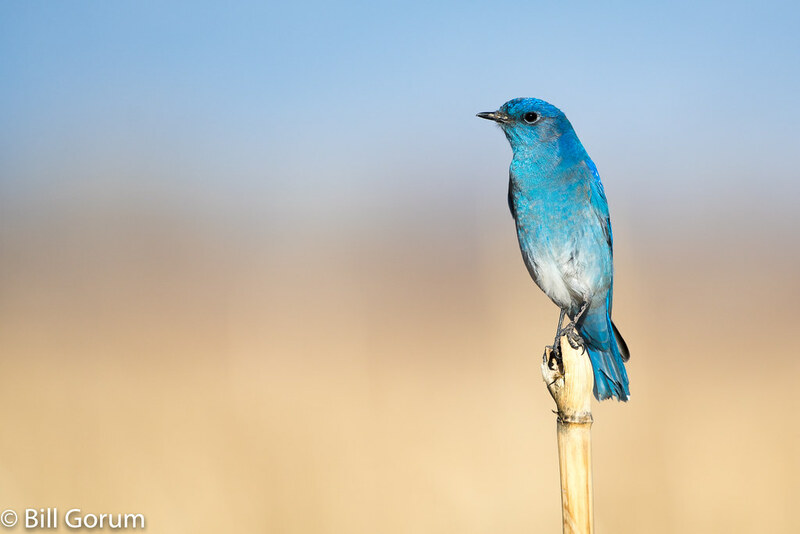 You know spring must be getting near when the Meadowlarks start singing! (Definitely one of my favorite bird sounds). This is how I spent Super Bowl Sunday. I never did get the exact picture I wanted of Sandhill Cranes battling. I wanted a side view, both birds in the air above the feeding flock, and the claws of one raking the breast of another as feathers fly. Next year! I’m not the only one who would rather watch birds than football. The one on the left won! One of the things I’ve been meaning to do for a couple years now has been to go up to the top of Sandia Crest during the winter to photograph Rosy-finches. There are three species that winter on Sandia Crest and apparently this is one of the only places where you can see all three together. All three are species of artic and alpine habitats and they summer from northern New Mexico up to Alaska, depending on species. This one is a Black Rosy-finch. Normally on Sundays, researchers from the University of New Mexico trap Rosy-finches. A birder friend and I planned our trip for a Saturday to avoid the researchers, (because we figured that would interfere with us getting natural photos, not because we have anything against the research), but as luck would have it the weekend we went they switched Sunday for Saturday. This picture is of a group of Rosy-finches heading into a trap. I have it labeled as Brown-capped, but the one in front actually looks more like the interior race of the Grey-crowned Rosy-finch now that I look at it again. We were kind of bummed about the researchers being there, (and I do think there presence probably cost us some photo opportunities), but they would bring banded birds outside for release after processing them and talk to the visitors there about the birds, which was cool and made for some different photo opportunities we would not have had if the researchers had not been there. Still, I want to try to go back in the future when its just the birds. Of course there were other species besides Rosy-finches there. These are two different subspecies of the Grey-crowned Rosy-finch that both winter at Sandia Crest. The one on the left is Hepburn’s (Coastal) Race and the one on the right is the Interior race. The Rosy-finches would arrive in big flocks about every 20-30 minutes, feed for a few minutes, and then all leave at once. The Cranes and Geese were restless at Bernardo 2 weekends ago. Now they are almost all gone. The departing of the Cranes and Geese signals the end of winter for me. Temperatures this coming weekend are forecast to be in the 70s, so hopefully a visit to a den will bring the first snakes of the year and the official start of spring! Great post! How late do the Rosy finches stay Sandia Crest? Wow, those are some amazing photo's. I was glad to see the ID on some of those birds that I se myself sometimes, living in the ABQ area. Are you sure your first pair of Snow Geese (backlit by sunset) aren't Ross' Geese? They look a bit stubby for snows, although I know there are smaller races of Snow Goose. Every time I see a new post from you regarding New Mexico, I fall in love all over again with our state. Winter in NM is stark, raw and beautiful; you've captured the mood, lighting, colors and hues exactly as they always are in my mind's eye. I can't single any one photo out as my favorite, I think they all must be. We've got to get out road-cruising again soon! Sorry guys, I posted this a long time ago and nobody commented for a long while, so I sort of stopped checking and didn't realize I had responses! Brian Hubbs wrote: Great post! How late do the Rosy finches stay Sandia Crest? Brian, some in time in March most years. chrish wrote: Spectacular as usual Bill. Chris, I think you're right. The vast majority of light geese at BDA are Snow Geese, so I sometimes get into the bad habit of not checking as closely as I should. Chris, definitely! I'm off till early August and we've been getting a bit of rain, so anytime you're ready. I've got a new phone number that I'll PM you.